Staffing costs are the major cost component of a contact center. With the variable nature of traffic demand, it is important that resources do not sit idle, raising costs whilst waiting for peak traffic times. To avoid these costs but still handle such variable traffic, many contact centers use Business Process Outsourcers. Teleopti's BPO Exchange module allows Resource Planners to directly view any upcoming short falls of staffing against expected demand and efficiently communicate with BPOs to close this gap. 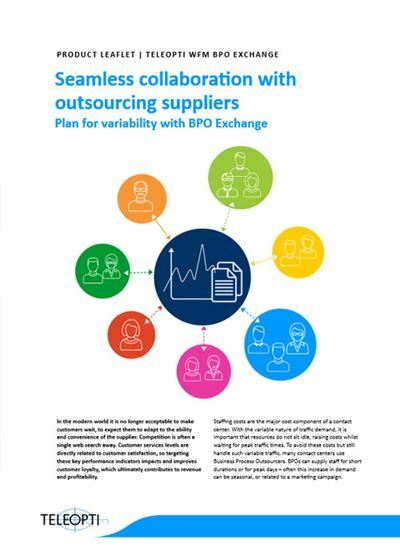 Keen to mind the resourcing gap using BPO Exchange? Read more in this leaflet.